For long exposures in strong winds a sturdy tripod is essential. The size of the camera also matters. 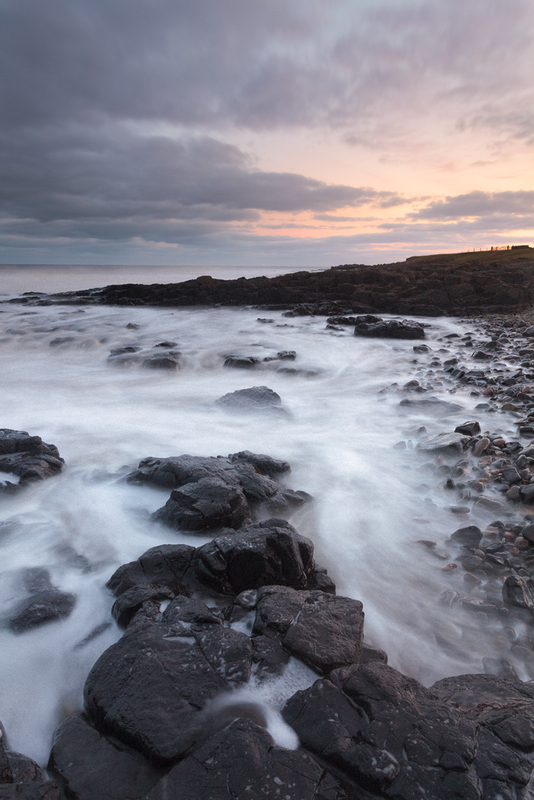 This last weekend was an interesting one as I was back in Northumberland photographing. I didn’t sleep much the night before which is often the case when making an early morning start, however this time it wasn’t the early start causing this; it was the howling wind. All night long the wind continued and well into the next day. In the morning we sat in the car just before daybreak watching the huge wave’s role in, creating huge plumes of spray from the top of each wave. It was at this point that I realised my lightweight tripod just wasn’t going to support my Canon 5D with filters; at least not without showing signs of vibration. In the end I decided I had to use my old Manfrotto 055 tripod which is much heavier and was in the car as a backup. Most of the results from the dawn shoot using the Manfrotto were vibration free and very crisp. Later in the day I switched back to my lightweight Velbon tripod which although still windy, t performed very well given I had a large DSLR mounted on it. The following morning was pretty much a repeat of the day before except the winds were even stronger. So strong in fact that I struggled to use the Manfrotto tripod with the 5D and ended up trying to shield the camera whilst holding down the tripod. I did manage a few wide angle shots with the smallest of my lenses but I wanted to use a long lens and in the strong wind I couldn’t. My solution was to switch the 5D for a Panasonic GX1 with 45-200mm lens. This gave the equivalent of a 90-400mm lens on the 5D. Interestingly the smaller profile and weight of the camera allowed it to sit solidly on the Manfrotto tripod. So, although the Lightweight Velbon tripod suffered in the strong winds, so did the 5D and best of all, the lightweight GX1 solved the problem. For me, you missed the most interesting aspect out – put a couple of day 1 (Canon) and day 2 (Pan) images on the table and invite people to tell you which & why. There is also a funny twist in the report. The ‘Lightweight Photographer’ ventures forth with a heavy-weight camera on a light-weight tripod and changes to a light-weight camera on a heavy-weight tripod. To borrow from boxing terminology, are you not ‘The Light-Heavyweight Photographer’? If you had seen the lightweight photographer on the day you would have laughed. I was using a Lowpro Mini Trekker backpack because of the 5D and 2 additional lenses. But then I had a further two GX1’s and 4 lense as well as the RX100. It appears lightweight doesn’t always mean less. Regarding the images, all the ones that aren’t quite sharp and a lot of duplicates have gone into the “bin”. The ones from day 2 are also very different in lighting and style so it wouldn’t make a good comparison. If you want a straight comparison between the 5D and the GX1 then the 5D wins but the GX1 puts in a good performance. Some tripods let you hang a weight such as your camera bag off the bottom of the centre stem and some have retractable spikes in the feet. Something to consider if strong winds are something you encounter often in your part of the world. I have tried a hook in the past on another tripod but the camera bag would catch the wind and make it even more unstable. I have found the best option is the lean down on the top of the tripod as you take the shot. Spikes are also good but it wouldn’t have helped this time as most of the areas I was shooting from were rock. These are good point you raise and thanks for commenting. Hmm, maybe I’ll hang onto my Manfrotto after all! I had a similar experience up on Dartmoor a couple of weeks ago with the GX1 + lightweight tripod, and gave up shooting due to the wind. Yes, don’t get rid of it yet. If mine breaks I need a someone who will sell me one that’s been well looked after.